Honest, with a strong sense of right and wrong, though there are times when his seriousness appears humorous. Lioconvoy has a harsh, career-military side to him, but also has a humane gentleness. There are times when he behaves as if he knows something about the secrets of the planet where the battle is taking place. Robot Mode: The first thing one notices about Lio Convoy is his rather assymetrical upper body design. With most Transformers figures that transform into four-legged beasts, the beast head either forms the chest or ends up in place of one of the hands. Not so with Lio Convoy. The lion head of his beast mode becomes his right shoulder. And while this isn't very practical for him, as it gives him a huge blind spot on his right, it looks very, very impressive. Speaking of impressive, Lio Convoy's entire look certainly is. The white, red, and golden color scheme looks great on him and his body is very lean, very detailed, and very posable. I especially like his chest design, which somewhat mirrors the classic Optimus chest, but gives it its own spin and doesn't disturb the lean, streamlined look of the body at all. The panel on the chest's left side can open up, showing Lio Convoy's sculpted Matrix. The one little thing that I don't like about this robot mode is, that his shoulder arrangement is a bit unstable. The shoulders, which are basically the back of the lion from head to tail, just sit loosely on top of the torso. Raising his arms too high causes the shoulders to 'rise', to the point where his head is almost completely obscured. It would have been better if the shoulder section would click solidly into place, even if that meant his arm movement would be more restricted. It's not a big thing, but it means you need to be a bit careful when posing the figure. Lio Convoy has weaponry in abundance. Each forearm features a flip-out missile launcher, as well as a double-bladed claw that flips out from the beast mode paws hanging underneath the arms. Two additional missile launchers are hidden in the lion's mane on his right shoulder. These can detach and be used as hand guns. Lio can also use his missiles as clubs, as they fit nicely into his fist holes. And finally the lion's mane on his shoulder can be made to spin like a buzz saw, which would probably have lethal effects in close quarter combat. Sadly I'm missing all but one missile for Lio Convoy's four missile launchers, but he's certainly not lacking any firepower. So all in all Lio Convoy's robot mode is pretty great. Some minor design changes might have made him even better and one shouldn't think about how he might deal with attackers appraoching from his right side, but other than that: Very cool. Possibly the best-looking robot of the Japanese Beast Era. Alternate Mode: Neither his name nor his look in robot mode leave much of a doubt into what kind of beast Lio Convoy transforms. He becomes a white lion with a golden mane and tail. When he's just standing there, the lion looks very impressive. The head appears to be a tad bit too large, but just might just be because of the big mane, which covers almost the entire front half of the body. Some robot parts are visible on its belly and the robot's joints can be seen a bit on the rear legs, but these are easily ignored. What's not so easily ignored is the lion's lack of posability. Not in the rear legs, these are fully posable thanks to double knee joints and posable ankles. But the front body is pretty much a statue. The head is immobile and the front legs only consist of the 'forelegs', so to speak. The 'upper legs', which would be somewhat hidden by the mane in a real lion, simply aren't there. The forelegs can move on ball joints, but pretty much any pose that's not simply standing looks more or less unnatural due to the lack of an upper leg. The claws from the forlegs can unfold here just as they can in robot mode, of course, but don't really look all that great due to the fact that they emerge from the bottom of the paws. Ligerjack pulled off the claw gimmick quite a bit better than Lio Convoy. The lion has an attack mode of sorts, as he can flip out all four missile launchers from the mane, making for an impressively armed beast. Still, even this very nicely done attack mode can't disguise the fact that Lio Convoy's beast mode is more for looking at than playing with. It's not a bad beast mode, mind you, but the thing with the front legs pulls it down quite a bit. Remarks: After the first season of the Beast Wars ended, Japanese producers decided to bridge the gap between seasons with their own Beast Wars series, called Beast Wars II. The storyline closely mirrors that of the original series, leaving two opposing groups of Transformers stranded on a strange, primitive planet where the good guys assume beast forms for disguise purposes. The leader of the Maximal group is Lio Convoy. As a figure Lio Convoy pairs a spectacular-looking robot mode with some minor design problems with a beast mode that is more for looking at than anything else, but pulls that part off quite well. I actually acquired the Robotmasters version of this figure first, which, despite its much smaller size, managed to fix some of the design problems this larger version suffers from. The lion mode still doesn't have proper forelegs there, either, though. Anyway, this figure here has some quirks, but overall I like it very much. This 'standard' version of Lio Convoy is actually less common (at least on ebay) than the transparent 'Flash' version. 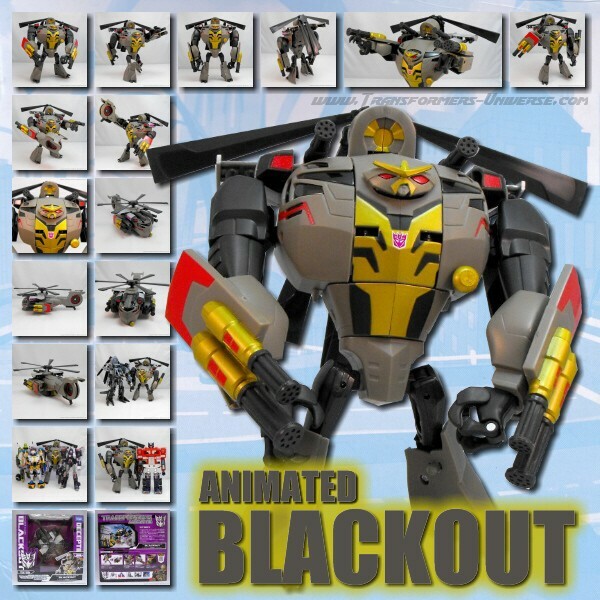 A third version of Lio Convoy was available in black (a black repaint? Oh, those wacky folks at Takara always come up with something new, don't they?). Whichever version, if you can get your hands on one and are a fan of either Beast Transformers or Primes/Convoys, then you should definitely grab it. It's probably not for everyone, but me, I like it a lot, so despite the shortcomics of the beast mode it gets a very good (if somewhat subjective) rating from me.